When the data that is stored on your computer hard drive becomes fragmented, it slows the overall performance of your computer system. This is because when files are fragmented, the computer must search the hard disk as a file is opened (to piece it back together), which can result in significantly longer load and response times. The Disk Defragmenter utility built into Windows 7 is designed to consolidate fragmented files and folders on your computer’s hard disk so that each occupies a single space on the disk. Having your files stored neatly end to end in this manner greatly increases the read and write speeds of your hard drive. This subsequently speeds up your computer and access to your stored data. If you have Windows 7 installed on your PC, you can follow these simple steps to defragment your hard drive(s) and speed up your computer’s loading time. Click Start > All Programs > Accessories > System Tools, and then select Disk Defragmenter. In the Disk Defragmenter dialog box, click the drives that you want to defragment, and then click the Analyze disk button. Your PC will analyze the drive(s) and a dialog box will appear letting you know whether you should defragment the analyzed drives. If your PC recommends defragmentation, click the Defragment disk button. The Progress area will allow you to monitor the status of the defragmentation. 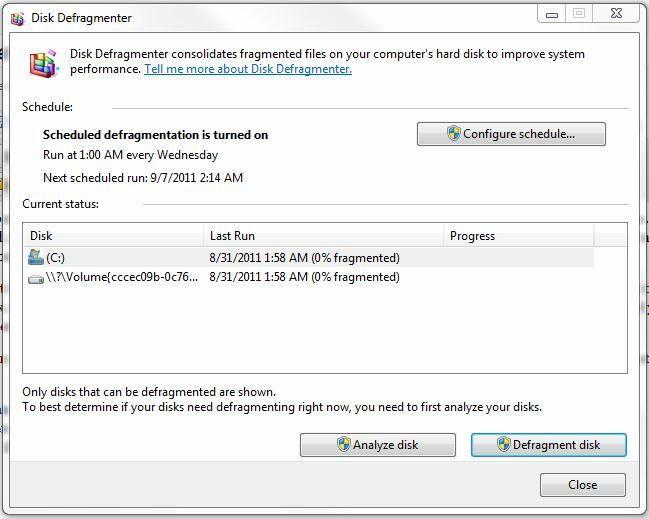 Once the defragmenting process is complete, Disk Defragmenter will display your results. You can now click View Report to see detailed information about the disk, or you can click Close to complete the defragmentation process. That’s all! Now, just remember to use the Disk Defragmenter utility to analyze your hard drive on a regular basis to keep your PC up to speed. Ideally, you should do this around once a week. If you would rather automate the process of analyzing your hard drive and performing disk defragmentation, sign up for Free Computer Maintenance.